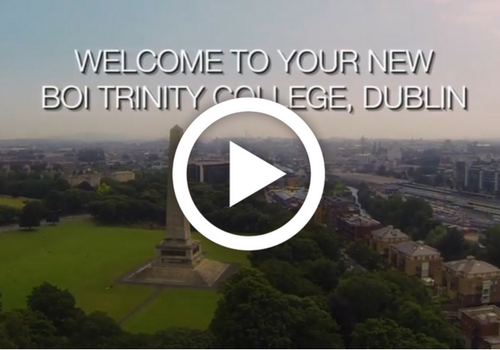 Bank of Ireland’s Trinity branch is home to a wide range of different communities – students and staff at Trinity College, local residents, start-ups, businesses and charities. Our new branch offers everyone a place to work, meet and support each other. Trinity Branch has moved to the Hamilton Building and that’s not all! Now offering free work spaces, meeting rooms, conference areas and event space to all, we actively support the different needs of our local community. Bank of Ireland Trinity is a start-up hub in the heart of Dublin city. It is available for all start-ups and businesses, and you don’t have to be a Bank of Ireland customer. We offer you somewhere to work from, with state-of-the-art facilities including hot desks and complimentary WiFi. Here you can get advice using a support structure that enables you to validate and grow your idea whilst learning from others. There is no need to book a space, just come on in – we look forward to welcoming you! There is also complimentary tea and coffee while you get to work. We will be running regular workshops and events for the college, business and community, so keep a check on our calendar to see what’s on over the coming months. Of course, we continue to offer a full banking service. We have a dedicated team who look after all your financial needs. Our Mortgage advisor is here to guide you on your mortgage journey. We also have a Business advisor on site to help you with all your business account needs. And our dedicated advisors are delighted to welcome you to discuss your financial needs. Events are available both during and outside office hours. Please get in touch to discuss times that suit you with our dedicated Event Executive.